Katya ([birthday day=”01.01.2001″]) participated in the Sofia Workshop in 2016. 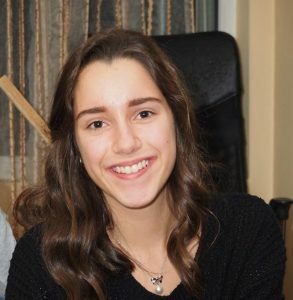 She is attending 7th Secondary School” Sveti Sedmochislenitsi” in Sofia. She really like music. In addition, she loves sports, and her favorites are Tae Kwon Do and swimming. She has trained in both for many years. She also enjoy travelling to new places, meeting new people and learning about other cultures. She would like to become an Anthropologist in the future. The first thing I would change in Europe would be to provide shelter and food for the refugees. Everyone deserves to live a decent, normal life, without being threatened every day. Moreover, I think we should treat the immigrants the way we would like to be treated if we had their misfortunate destiny.